Collin (Daveed Diggs, Black-ish) is trying to make it through his final days of probation for an infamous arrest he can’t wait to put behind him. Always by his side is his fast-talking childhood bestie, Miles (Rafael Casal), who has a knack for finding trouble. They grew up together in the notoriously rough Oakland, a.k.a. “The Town,” which has become the new trendy place to live in the rapidly gentrifying Bay Area. But when Collin’s chance for a fresh start is interrupted by a life-changing missed curfew, his friendship with Miles is forced out of its comfortable buddy-comedy existence, and the Bay boys are set on a spiraling collision course with each other. Exploding with energy, style, and raw emotion, BLINDSPOTTING unravels today’s intersection of race and class with urgent and poetic justice. 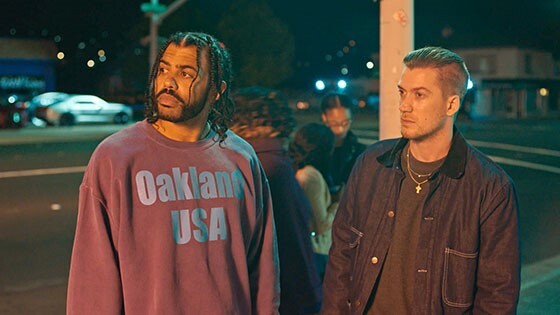 The electrifyingly talented cast serves Oakland’s heart and soul on a platter, and the film’s stars—Rafael Casal and Daveed Diggs—also co-wrote the script. Boldly directed by Carlos López Estrada, this provocative hometown love letter glistens with humanity, dropping you into a vastly layered story and asking what you see.